Resources for Grief offers a free "Self-Care Tip of the Month" for anyone involved in caring for the dying and/or bereaved. These monthly emails are designed to inspire, encourage and promote self-care in the midst of such rewarding but challenging work. 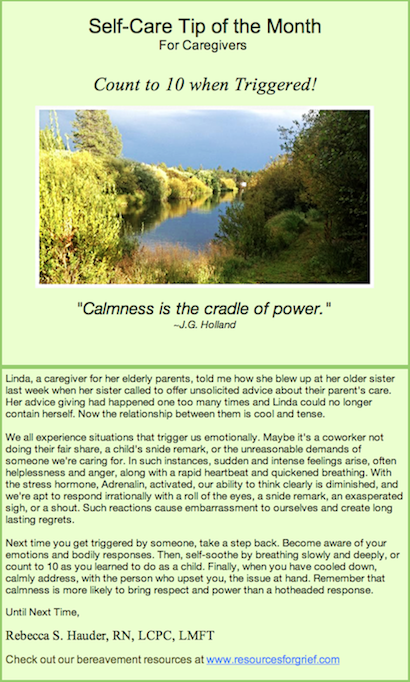 To receive our "Self-Care Tip of the Month," simply provide your email address. Resources for Grief will not sell its email list and you have the opportunity, at any time, to decline the emails. "Thank you and keep the emails coming. They seem to show up just when needed!" "I often read the emails in our team meetings. Thank you for this valuable resource." "I really enjoy the emails, and intend to start sharing them with some of our families."